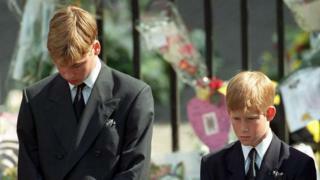 Interviews by Princes William and Harry for a BBC documentary on the death of Princess Diana - to be shown this weekend - make the lead for several of Wednesday's newspapers. "He was there for us", is the headline in the Daily Express, which has a picture of the Prince of Wales alongside his sons as they walked behind Princess Diana's coffin during her funeral procession. The Daily Mail and the Daily Mirror use similar headlines, with the former saying "Moment daddy told us mummy was dead". The newspaper says the Princes speak with raw honesty about their emotions at the time. The government's paper setting out its position on what influence the European Court of Justice should have on the UK after Brexit is the lead for the Daily Telegraph and the Guardian. The Guardian says the document appears to leave open the possibility that the court could retain an influence over the UK - and the government has been accused of a U-turn. The Daily Telegraph reports that Eurosceptic Tory MPs fear the government's approach raises concerns that Britain could be bound by the decisions of the court for years to come. "Europe under threat", is the headline in the Times. It says the Libyan prime minister has warned that Europe will be increasingly at risk from terrorists posing as migrants unless western capitals help his country to stem the numbers crossing the Mediterranean. In an interview for the paper, he says Europe's response does not match the challenges Libya is facing over the flow of illegal migrants crossing its open southern borders. The i highlights US President Donald Trump's decision to send more troops to Afghanistan - and Britain's backing for the policy. The paper's correspondent, Kim Sengupta, writes that there can be no illusions about the cost of ignoring Afghanistan. He says US and UK forces left in 2014, declaring that Afghan troops were now fully capable of defending their country. But, he adds, the insurgents have since taken over swathes of the country, attacking Kabul seemingly at will. For its main story, the Sun reports that a British man has been detained in Turkey over a few coins he found while snorkelling on holiday. It says 52-year-old Tony Robyns, from West Sussex, was arrested at Bodrum airport last Friday as he and his family were preparing to return home. According to the newspaper, security staff found the coins in his hand luggage and deemed them historical treasures. It says the father of five is being held on suspicion of "finding Turkish artefacts without notifying the authorities". A friend of the family is quoted as saying Mr Robyns had not been aware of the coins' significance and had decided to take them home as a souvenir of his holiday. A number of papers report that there has been an 183% increase in planning applications for basement extensions in England, Scotland and Wales. The Guardian says that homeowners - unable to climb the housing ladder because of high prices - have decided to burrow down instead. A London-based property agent tells the newspaper that many people are doing whatever they can to improve their homes rather than move, with punching up into the attic or digging down to create more space now a viable alternative.